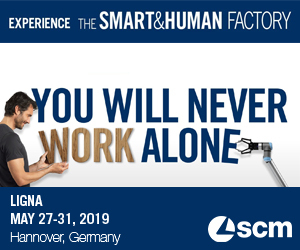 LIGNA 2015 in Hannover, Germany is coming up in May and many of us will be visiting this most important equipment tradeshow for the woodworking industry. 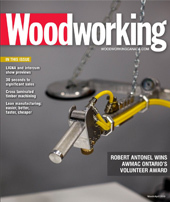 There is a new buzz going around in the European manufacturing industry; not just the woodworking industry. The term Industry 4.0 was used for the first time at the Hannover Messe show in 2011 and originates from the high-tech strategy of the German government, which promotes computerization - to a much larger scale than is currently used - of the manufacturing industry. We have had three industrial revolutions in the past. The invention of the steam powered engine lead to the first industrial revolution. With the implementation of electrical power and assembly lines at the beginning of the 20th century, the second industrial revolution brought us mass production. This was followed by the digital revolution, the use of electronics, IT, and robots to further automate production. And now leading edge technology is yet again entering a revolutionary change. This fourth industrial revolution is fueled by the need to regain manufacturing shares lost to low-wage-cost regions in Asia and South America. Europe and particularly Germany, is driving the development in a unique combination of industry and government funding. This fourth industrial revolution is already underway and experts are talking about a fast and disruptive change for most, while some industries might have more of an evolutionary change. Only one thing is certain, this major change will come and there is no going back! It is projected that the physical environment will be seamlessly integrated with the information network. The Internet is combining processes, systems and intelligent machines to form a sophisticated network. The publications refer to the Internet of Things (IoT) and the Internet of Services (IoS). From here on in, the concept/theory becomes complicated. With all the publications in print and on the Internet you will find it difficult to get a simple explanation of the subject. At the recent German ZOW tradeshow in February, an important meeting place for the suppliers (hardware, board material, lacquer, prefabricated parts, services) to the industry, some solutions where shown. Suppliers showed partial solutions and elements like RFID’s and software, however the overall vision and plan has not been presented yet. In a revolutionary change, current rules often no longer apply. Changes are fast and can be disruptive and even destructive. If you briefly look into other industries, companies like Google or Apple have completely changed the game in the music and communication/phone industries, and we expect further changes in the entertainment/TV industry, as well as the automotive industry. We are just at the beginning of this revolution. So once change gains traction with at least one company, the rules of the game could change very quickly. Companies are implementing more and more sophisticated manufacturing software. The best in class process their customer orders seamlessly to purchase orders and manufacturing orders. With a few clicks, automatically prepared purchase orders are released to suppliers and production orders are passed to the shop floor providing information in suitable machine language to retrieve material and place it at/in the machine. The required cutting plan, nesting plans or other CNC programs are almost instantly available for machines. Suitable work instructions, printed or on screen, interface with the operator. Barcodes or RFID’s allow the software to collect feedback from the shop floor to update the software regarding the production process. This is still considered the ‘third industrial revolution’ and a significant number of Canadian companies have not yet mastered this level of sophistication. The fourth industrial revolution is building on previous advances and in order to enter the new technology you first need to build strong foundations by implementing the above technology properly. Next we will see machines communicate with each other. The work pieces talk to the machine and the system talks to the vendors. For example, if a customer delays an order (or wants to expedite the delivery) the system would optimize according to the new situation. It would check the availability of all required materials and parts, including the suppliers systems. It would sideline current production orders to allow the now more urgent priorities to be manufactured first. If the optimization recognizes sufficient unused machine capacity it might advance an upcoming maintenance and service call on the machine, but not until the service technician and the required spare parts are confirmed. The system would then inform the worker or the management what the recommended course of action is. Is this Utopia? Not anymore. The manufacturing industry is moving towards this level of sophistication. Can we wait until this trend passes and life returns to normal? Let me answer the question with a question. Could your business survive if you didn’t invest in the technology brought by the third industrial revolution (computers, software, CNC machines)? The answer to both questions is NO. Since we know we need to address Industry 4.0, the next question is how quickly do we need to act? This depends on many factors. Are you currently in a comfortable position with no market pressures? Do your competitors have no interest in modernizing their plants? Do you foresee little or no competition from Europe, South America or Asia? Well, in that case you have lots of time. But the reality is that we all need to start addressing this subject. That does not mean you need to stop buying machines and you need to buy Industry 4.0. First of all, you cannot buy a ‘plug and play’ version, which would fit your factory - you need to build it yourself. You also need to complete your transition through the third revolution. Picture it this way; you are not setting a new goal; your measurement bar has just gotten raised by a huge amount. Does your market accept mass produced product with little variations or does the market demand high variety in short delivery? Are products complex and are variations the exceptions, or is there almost no difference between standard and special orders? Are you producing into a finished goods warehouse to ensure short lead times, or do you have flexible manufacturing to allow order specific production? Is the material supply to assembly and shipping inconsistent, or does the organizations currently ensuring consistent high levels of performance? Standard product has BOM’s, but do special orders need to be created manually? If product does not arrive in the buffer on time, do we need to look for it, or is there sufficient monitoring to ensure effective controls? Are machines repaired only when broken, or is systematic preventive and predictive maintenance fully implemented? Do employees stay on the same workplace for a long time, or is cross training implemented? When answering these questions in more detail a true picture will emerge. It will show where the company needs to improve in order to achieve the batch size 1 capability, which will be a prerequisite in most cases. Interoperability: In the future, equipment, software tools, workpieces and humans are networked and will communicate with each other. Standard communication protocols are essential. Virtualization: The manufacturing processes (physical world) is replicated and linked to virtual models and simulations. Decentralization: This technology allows localized decision making for routine tasks. Only critical issues like machine failure are delegated to higher levels. Real-time Capability: This technology allows the plant to immediately react to equipment failure and re-route the remaining production orders. Service Orientation: All services of companies, systems and employees, are reflected and stored on the Internet and can, if needed, be used internally and externally. The dividing lines between the Internet, the machines, the software, the tools and the workpiece will start to disappear. Everything will be connected. Before you visit LIGNA, start the discussion in your company; IT, manufacturing, engineering and production need to learn the basics of Industry 4.0 and synchronize their approach on this subject. At this time, no company is ready for this change. Industry 4.0 is too new. But if you don’t start the discussion now, and if you don’t do your fitness test and don’t read up on the subject, you will miss the opportunity to ask the right questions when you get to the show. Your next step should be to compile a strategic plan, your company-specific Industry 4.0 vision. If you do not plan and budget for it, it will not happen. I hope to see you at LIGNA 2015 in Hannover!